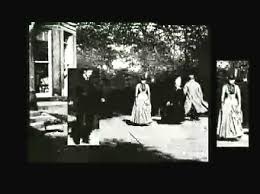 The earliest celluloid film was shot by Louise Le Prince using the Le Prince single-lens camera made in 1888. It was taken in the garden of the Whitley family house Roundhay Cottage, Roundhay, possibly on October 14, 1888. It shows Adolphe Le Prince (Le Prince’s son), Mrs. Sarah Whitley, (Le Prince’s mother-in-law), Joseph Whitley and Miss Harriet Hartley. The ‘actors’ are shown walking around in circles, laughing to themselves and keeping within the area framed by the camera. It lasts for less than 2 seconds and includes 24 frames. Louis A A le Prince had begun designing a single lens camera in 1885 and applied for a US patent on 2nd November 1886. A replica of his camera is displayed at Armley Mills Museum, Leeds. It is not certain whether Louis A A le Prince managed to project his pictures. There are various testimonies claiming that he succeeded in doing so, though E Kilburn Scott who installed an arc lamp as a projector light source for le Prince, does not mention ever seeing pictures projected. None of the films or projection apparatus is known to have survived. All that remain are copies of paper prints from sections of three films. On 16th September 1890 Louis le Prince mysteriously disappeared. He was last seen boarding a Paris train in Dijon. A photograph of a drowning victim from 1890 resembling le Prince was discovered at the Paris police archives during 2003. Roundhay Cottage, later renamed Oakwood Grange, was demolished in 1972. Nothing remains but the perimeter wall at the far end of Oakwood Grange Lane. (for those with imagination – a house with a similar bay window remains where Oakwood Grange Lane meets Oakwood Lane). Modern Houses occupy the site today in a road appropriately called Oakwood Grange. Oakwood Lane was once known as Horseshoe Lane. Horseshoe Cottages stood in the middle of what is now its junction with Roundhay Road, Wetherby Road and Prince’s Avenue. Around 1900 Springwood House built by Stephen Nicholson and now known as Frazer House, was lived in by Arthur Green Lupton of Messrs Wm Lupton & Co, a well known family of woolen merchants and manufacturers.